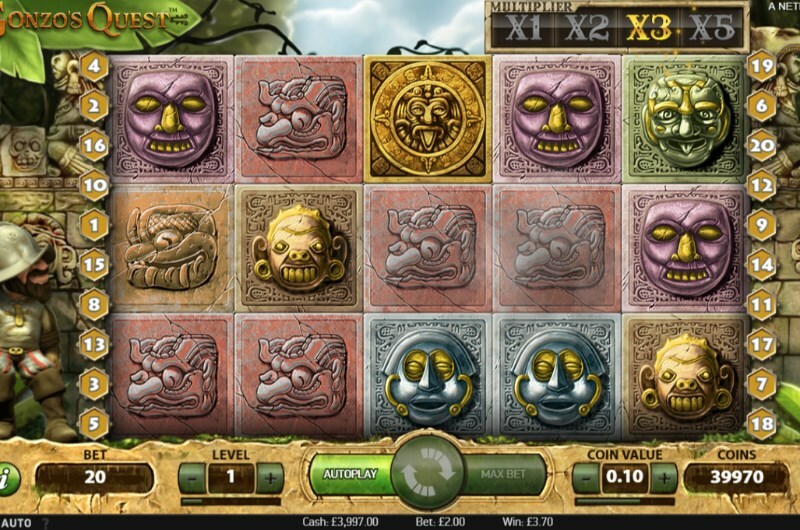 Featuring everyone’s favourite well-trimmed conquistador, Gonzo’s Quest slots is a 20 payline slot from developers NetEnt. Launched in 2010, NetEnt's popular slot has captured the hearts of millions of players around the world. And this is partially because this was one of NetEnt's first mobile optimised slots. 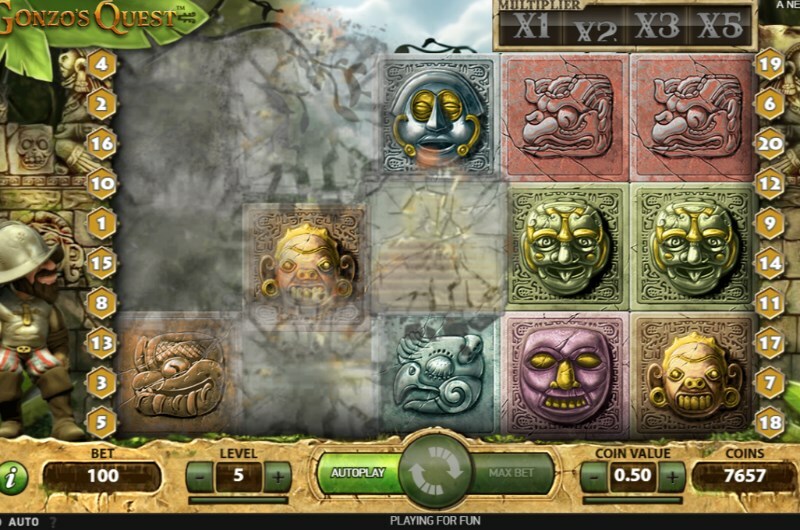 Gonzo's Quest slots free spins are an in-demand bonus at many online casinos. Thanks to the tumbling reels format, this is a great beginning slot for new players. In fact, this game plays out more like a game of Tetris rather than a slot. To win, you simply need to match a combination of symbols on one of the winning paylines. Those symbols will then explode, leaving room for more to join. In total, there are seven paytable symbols consisting of high value pays and low value pays. The highest paying symbol in the game is the blue mask. Before you start trying to trigger an avalanche of wins, you will need to choose your ideal stake. You may have read in other Gonzo's Quest slot reviews that the game is a fixed payline slot. This means that you are unable to take away any of the 20 paylines. You can, however, change the bet level of the game and adjust the coin value. Tweak these components until you find a spin value you are happy with. Then simply press the green spin button to get started. The game also features several useful components for more advanced players. The autoplay feature, for example, is perfect if you want to play for longer periods of time. Press the button - and you will be given a range of spinning options. You can either choose one of the pre-made options - or use the advanced settings. Here you can add stops on the controls to halt gameplay based on various factors. For example, if you land a win or trigger the bonus feature. This game popularised the idea of tumbling reels slots - despite the format being available for many years prior. You may be wondering what these tumbling reels are. Essentially, any symbol in a winning combination will explode, causing more symbols to join from the top. This has two benefits; one, you can experience a combo of separate wins from the same win. And two; every successive win will increase a multiplier, potentially resulting in 5x multiplier wins. During both the base game and the free spins, keep an eye out for the wild symbol. This symbol can substitute for all other symbols in a winning payline, resulting in more cascading wins. The main bonus feature in the Gonzo’s Quest slots is the Free Fall bonus. And this is activated when three of the golden mask bonus symbol appears. Think of this as simply 10 free spins that will leverage the tumbling reels mechanic. The obvious highlight of the Free Falls feature is that any multiplier win from successive waves is tripled up to a massive x15. Hit wins with this kind of multiplier and you will be watching Mr. Gonzo doing his victory dance in no time at all. The Free Fall bonus can also be re-triggered for even greater wins. To restart the bonus, you will need to match the three scatter symbols during the free spins. This will award a further 10 free games. Best of all is that re-triggers are unlimited. You could technically go on forever if Gonzo is in favour with lady luck. The intro movie promises a visual feast you won't forget - and the game does indeed deliver. Gonzo's world is brought to life with stunning graphics. In fact, if you get the chance to claim a Gonzo's Quest slots no deposit bonus, we highly recommend claiming it just to see how visually rich the game is. The games Hollywood looks are further enhanced by a rich soundtrack that portrays the jungle ambiance. The Spanish explorer will even mutter to himself now and then. Yes, Gonzo waits patiently at the side of the reel, hoping for you to crack open the way to El Dorado. Speaking of the chubby conquistador, he is an animated gentleman to watch - and will share in all your wins. And you will definitely find yourself smiling if you hit a big win. Gonzo will dance and collect coins in his hat, sharing a portion of the spoils. What's interesting is that this NetEnt slot started a trend with leaving mascots at the side of game reels - something which many other games have adopted since. 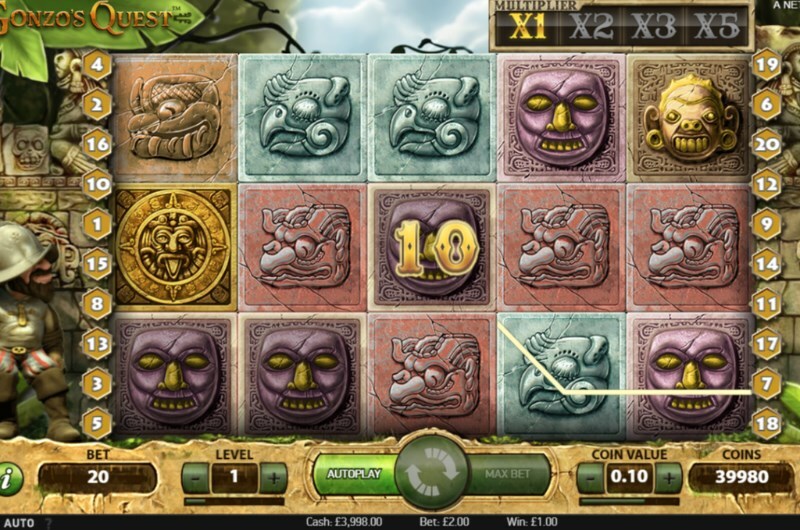 Gonzo's Quest slots features an above average return to player of 96%. The game is also a medium variance slot, meaning it sits in the middle of the road between giants wins and low value wins. Despite the promise of El Dorado gold, this is not a progressive jackpot game. Therefore, you won't be able to win millions from a single spin. You will, however, be able to benefit from a range of low value and high value wins thanks to the medium variance. The maximum symbol line pay in the game is five of the blue face symbols - which will award 2500 coins. Thanks to the tumbling reels, you could potentially land this combination of symbols over and over again. It's not difficult to see why Gonzo has become such a worldwide smash hit. This slot game is an absolute classic, only rivalled by Starburst slots in terms of pure gameplay. Simple, fun and brimming with winning opportunities - Gonzo’s Quest is an adventure to remember. You can now indulge in this NetEnt casino slot at Pots of Gold Casino on your mobile, tablet or PC.